Bij het installeren van openSUSE kan de automatische configuratie van het X systeem gedeeltelijk zijn mislukt. Dit resulteert in ofwel een zwart scherm na het opnieuw opstarten of de verkeerde resolutie wordt op de monitor getoond. 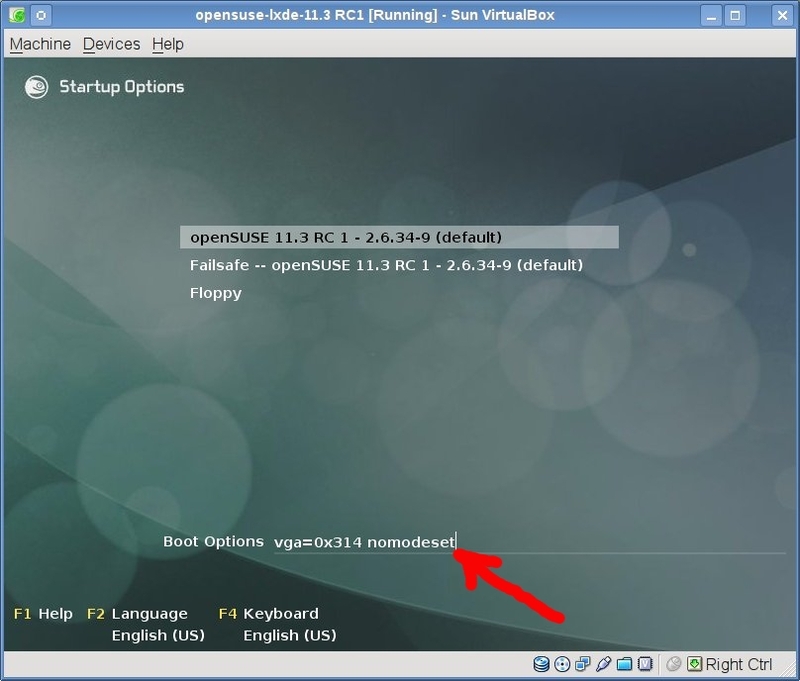 This guide is for all current and supported openSUSE versions up to and including openSUSE-11.3. Typically the cause is your graphics are not configured properly. The reason for the misconfiguration can vary, dependant upon your openSUSE version. It is also important to determine what graphic hardware one has on their PC, and what graphic driver one is using on their PC. There is guidance on that given in this forum guide which will soon be converted to an openSUSE Graphic Card Practical Theory wiki. If you are not logged in to the openSUSE forums you may need to click on that link a second time. It is recommended you read that, and in particular pay attention to the section for your graphic card manufacturer (typically ATI, nVidia, Intel or VIA), prior to returning to this page to recover/configure your system's graphics. Experienced Linux users should note that in many cases an /etc/X11/xorg.conf file is not needed for openSUSE-11.2 / 11.3. Versie: 11.3As of openSUSE-11.3, the legacy graphic configuration wizard "sax2" is no longer included with openSUSE, hence this section provides various suggestions how to restore one's graphics on openSUSE-11.3 when there is a graphic configuration problem. Users of openSUSE-11.2 or earlier please go down to the With SaX2 section below. New users, to explain better for you, please note you enter this boot code in the very first openSUSE menu you see when you switch ON your PC. Just start typing and you will see the letters for 'nomodeset' appear in the options line of the menu. Then after entering that, press <enter> and let your PC boot. Hopefully that will be sufficient and you will have a functional desktop at that time. The openSUSE-11.3 release notes provide more detail, especially on how to make this permanent. If this works, you "may" wish to stop here. The 2nd thing to try (if the above did not work) is to try booting from grub with either (1) if installation failed with the safesettings (selection under the grub F5 "kernel default" menu item; or (2) if from an installed system with the boot option failsafe. Hopefully that will allow you to boot to a functional desktop. If this works, you "may" wish to stop here. But for users with installed systems, whether that succeeds or not, you may wish to read on to see if you can better optimise your system. The 3rd thing to try is boot to run level 3 (a full screen text mode) and try to use the installation graphic configuration file xorg.conf.install as a temporary measure. You can do this by typing 3 when the very first openSUSE menu appears, and you should see a 3 in the options line. Then edit the /etc/X11/xorg.conf.d/50-device.conf file, adding an entry for your chosen graphic driver. You will need to do this edit from a text editor (such as the mc editor(recommended - see link for installation/use details) or the vi editor or the nano editor or joe editor ... and there are many other editors) with root permissions. enter root password when prompted, and make the needed edits, and exit the mc editor afterward, being very careful as one is using this editor/file-manager with root permissions. where in the example above the line Driver nv was added to try force the load of the open source "nv" graphic driver for nvidia cards. It is important one read the practical theory guide referenced above to understand what graphic drivers may be available. command and hopefully your PC will boot to X window graphical desktop and if this works, you "may" wish to stop here. The 5th thing to try is to try to create your own version of the "classic/legacy" xorg.conf custom configuration file for the graphics. This is more precisely known as the /etc/X11/xorg.conf file. In fact this step does in part what the old sax2 configuration wizard used to do for openSUSE (but this is less capable). Some users may even have a copy of their old xorg.conf from a previous Linux install that they might try (although it may not work with openSUSE-11.3). Again, if you have not read the practical theory guide referenced above, PLEASE do so now, else this step will be difficult to understand. That will create the file /root/xorg.conf.new. If you are lucky, you will then be able to reboot (as described above) by typing su -c 'shutdown -r now' and you might successfully boot to an X window desktop. 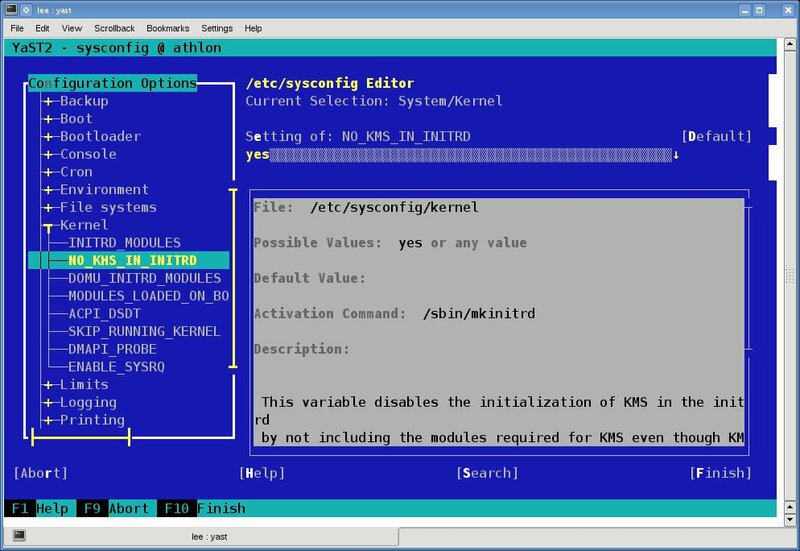 However its also possible you may need to change the driver in that /etc/X11/xorg.conf file, and to do so you need to open it with a text editor (such as the mc editor(recommended - see above fourth step for example of its use) or the vi editor or the nano editor or joe editor ... and there are many others) with root permissions and then change the driver. For example you may need to change "nouveau" to "nv" in the device section of that file, such that the "nv" driver is used instead of the "nouveau" driver. 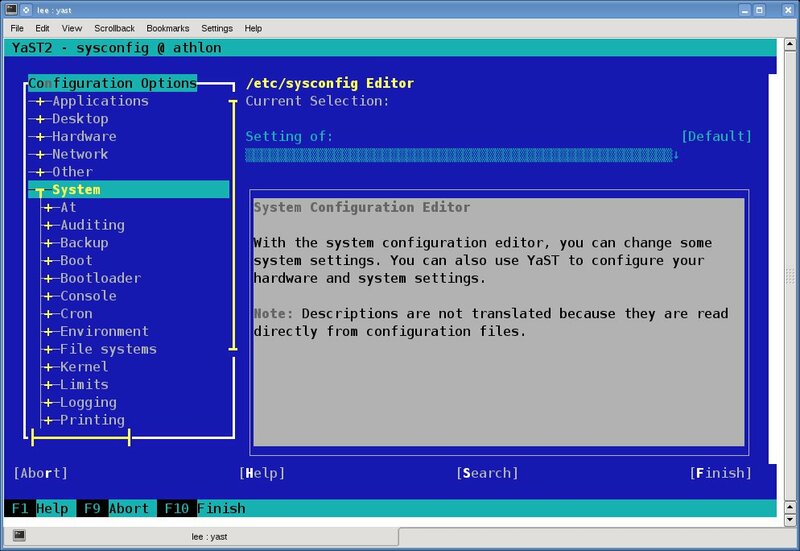 and also change NO_KMS_IN_INITRD to "yes" with the sysconfig editor (see step#4 above). If instead your PC has an Intel or a VIA graphic card or other graphic card, then you need to again consult with the practical theory guide to determine what your options are for the VIA and Intel graphics devices. This section is for users who have an openSUSE version that is 11.2 or earlier, where the SuSE-GmbH developed sax2 graphical configuration wizard is still available. Note that some of the "steps" above used for openSUSE-11.3 (such as steps #2, #3, and #5) are also applicable to older openSUSE versions. If you have an ATI or nVidia graphic card you can follow the details of the older openSUSE wiki for Configuring Graphic Cards which was mostly limited to users of those cards in its guidance. Users of openSUSE-11.2 and earlier, to configure X window graphics, can boot to runlevel 3 (as described in the 3rd thing to try under openSUSE-11.3 above), login as a regular user, and then 1st backup any existing /etc/X11/xorg.conf file. and then run the program sax2 to configure one's graphics. Note that sax2 has many possible input arguments in order to better tune the xorg.conf file that it creates. For example one can specify which graphic card to use (if one's PC has more than one graphic card/device) or one can specify which graphic driver to use. Deze pagina is het laatst bewerkt op 22 okt 2010 om 21:29.